Sneha Magapu Sneha Magapu, a lead dancer and faculty member of Shankarananda Kalakshetra, had her initial training in Bharatanatyam from Smt Divyasena, Chennai under whom she performed her Arangetram. After moving to Hyderabad to pursue a career as a software engineer, in Microsoft R&D, Sneha joined Shankarananda Kalakshetra, to further hone her talent. She continues her advanced training from Ananda Shankar Jayant, and also handles the Madhapur branch of Shankarananda Kalakshetra. A bright and ebullient dancer, Sneha brings precision and sharpness to her dance. Sneha brings a rare musicality to her dance, trained as she is in music and rhythm. She tours with the Shankarananda Kalakshetra ensemble regularly and was also a lead artiste at the Festival of India in Brazil in 2011. A graded artiste of Doordarshan, Sneha enjoys her roles as student, teacher and performer, even while she holds a day job with Microsoft. Krithika Varsha Krithika Varsha, has been trained in Bharatanatyam at Shankarananda Kalakshetra from the age of 8 years. Tall and lissom, Krithika debuted into the world of Bharatanatyam, in March 2007. With her sprightly movements and Abhinaya, Krithika has caught the eye of the art critics, as a dancer of rare promise. She has been an integral part of the repertory and has essayed lead roles in the many productions of Shankarananda Kalakshetra. Krithika, has been part of the ensemble that was sponsored by the Indian Council for Cultural Relations (ICCR) for dance performances at Corfu Festival, Greece, Syria, Edinburgh Festival - UK and Festival of India in Russia, Festival of India in Brazil, and Festival of India in Jakarta, Indonesia. Kirthika, is an emerging solo dancer with performances as a soloist, including the inaugural performance at Krishna Gana Sabha. Krithika, also had the unique opportunity to dance at the Rashtrapathi Bhavan, New Delhi, in the presence of the President of India, and other dignitaries in honour of the visiting Russian President. A graded artiste of Doordarshan, Krithika is the recipient of the Big Rising Star Award presented by the Big CBS Group, and the Young Achievers - 2012 Award for Excellence and Achievements in Dance Presented by Public Relations Council of India (PRCI). An Electronics Engineer, Krithika is also a faculty member at Shankarananda Kalakshetra, training beginners and juniors at the Film Nagar studio. Niloshree Bhattacharya Niloshree Bhattacharya, started her initial training in Kolkata under veteran Guru Smt. Thankamani Kutty and obtained a diploma in Bharatanyam from Kalamandalam, Kolkata. She later performed her Arangetram under Guru Sri Kalamandalam V.R. Venkitt. She joined Shankarananda Kalakshetra when she moved to Hyderabad to pursue higher studies, and has been with Shankarananda Kalakshetra since the last 7 years. A graceful and charming dancer, with exquisite and delicate Abhinaya, Niloshree essays lead roles in the various dance productions of Shankarananda Kalakshetra. She has travelled widely in India as part of the repertory and has also toured under the aegis of the Indian Council for Cultural Relations (ICCR) for dance performances at Corfu Festival, Greece, Syria, Edinburgh Festival - UK and Festival of India in Russia,and Festival of India in Jakarta, Indonesia. A Senior Research Fellow at the Hyderabad Central University Niloshree is a Ph D Scholar in the Department of Sociology, and continues with her deep passion for dance. Chelna Galada Chelna Galada, was initiated into Bharatanatyam at the age of six, when she began to train at Shankarananda Kalakshetra . For a first generation student without any family background in classical dance, Chelna with deep commitment and dedication has grown into a brilliant dancer and performs with precise footwork, clear angashuddam and nuanced abhinaya. Chelna, a graded artiste of Doordarshan, has been part of the repertory of Shankarananda Kalakshetra and has taken lead roles in the many dance productions of Shankarananda Kalakshetra. She has performed extensively in India at major festivals and has also toured with the repertory to Brazil for the Festival of India in 2011. A student of Microbiology, Chelna is also a devoted and exacting teacher of dance and trains the beginner and junior students at the Film Nagar studio as a faculty member of Shankarananda Kalakshetra. A recipient of the Brahmikala Samman, from Kolkata, Chelna has added new items based on Jain philosophy and Jain stories to the Bharatanatyam repertoire. Aparna K Sharma Aparna K Sharma - A much awarded and well known dancer from Kerala, Aparna, joined the Shankarananda Kalakshetra repertory after completing her Masters in Bharatanatyam from Hyderabad Central University. Trained in Bharatanatyam, Kuchipudi and Mohiniattam, Aparna, is also an excellent Carnatic musician. Performing with precision and ease, Aparna, is an emerging solo dancer, and performs regularly on the circuit. A dedicated teacher, Aparna teaches at Maniphal and Kerala. She tours often with the Shankarananda Kalakshetra ensemble and has performed in major festivals, including the Festival of India in Brazil in 2011. Anisha Datla Anisha Datla, joined Shankarananda Kalakshetra at the young age of 7 and has since then been a dedicated student and performer . She has steadily matured as an extremely graceful and sensitive dancer. Imbibing the clear angashuddam and split second tala precision that is a hall mark of her Guru, Anisha, has also learnt to internalize her art to present subtle and nuanced abhinaya. Endowed with a lissome visage, delicate features, and a phenomenal memory, Anisha, has been a part of the repertory of Shankarananda Kalakshetra, performing and touring with the ensemble. She has performed in Brazil for the Festival of India in 2011 and also presented a solo performance at SIFAS, in Singapore in 2012. A student of Engineering, Anisha makes time to chase her passion for dance. Jalamangala Soundarya Leheri Jalamangala Soundarya Leheri, was initiated into the beautiful world of Bharatanatyam, at the age of 8 when she joined Shankarananda Kalakshetra. 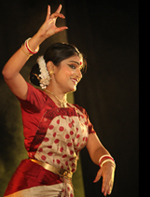 Leheri who performed her Arangetram in 2011, has grown into a strong dancer, with precise footwork and subtle abhinaya. Tall and statuesque, with a lissome visage, along with a deep musical understanding, Leheri brings to her dance a quiet strength and sensitivity of portrayal, internalizing as she does the deeper meaning of her art. She has been a part of the ensemble of Shankarananda Kalakshetra and has performed in some of the major productions of the institution, in major festivals of India. A graded artiste of Doordarshan, Leheri also performs often as a soloist in major festivals of Andhra Pradesh, and has performed at the Nandi awards inaugural function, the AP formation day, Delhi,etc. Jinakaraj MP Jinakaraj MP, has shot to fame as a creative and energetic dancer on the popular dance show on MAA TV. Also known as Janak on the TV show, Jinakaraj is trained in the Kalakshetra style of Bharatanatyam from Kerala having trained under Kalakshetra Vilasini and Usha Menon. A dancer with clear Angashuddha, and tala presicion, Jinakaraj brings extraordinary energy, power and vigour to his performance. He is an integral part of the Shankarananda Kalakshetra repertory and has performed in major festivals in India, and has also travelled with the ensemble to Russia, Greece, Syria, UK, Brazil, and Liechtenstein. He also performs and choreographs for contemporary dance events, dance based Television shows and Malayalam and Telugu movies.